As the earth heats up and droughts become more prevalent across the country, American gardeners are learning, in many cases to their chagrin, that the broad expanses of green lawn that have long been a staple of the American landscape may no longer be sustainable. These lawns are water-guzzlers and, as water becomes more dear, it is more and more obvious that the traditional lawn has to go. Moreover, that traditional lawn as it has evolved over a century and a half has become a time-consuming, synthetic chemical-sucking monster. It is not good for the environment and it is not good for the humans who must spend an inordinate amount of time grooming it. Although it may appear an inviting place for kids and pets to play, its dependence on chemicals which remain in the ecosystem can make it a dangerous place for even those activities. John Greenlee, a nurseryman and garden designer with decades of experience behind him, thinks that he has a better idea. He has written this very helpful and beautiful book in support of that idea. He believes that the time for transition to meadow gardens, which rely heavily on native grasses and wildflowers, has come. The native grasses and wildflowers are already adapted to their areas. They require minimal (if any) supplemental water and almost no care once installed and established. They are the perfect garden for the times and for the lazy gardener. Like me. People sometimes think of a meadow garden as a wild and rather messy place and they may think they don't want that in their front yard. 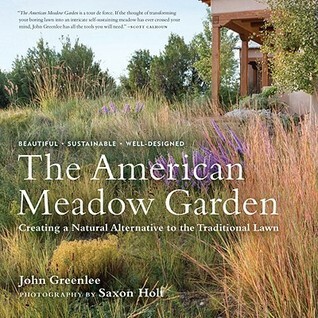 But Greenlee shows that such a garden is not a random assortment of messy and anonymous grasses. Instead, it is a complete mini ecosystem which has as its basis a variety of regionally appropriate native grasses. Mixed in with those grasses are many perennial and annual wildflowers and altogether, these plants form a colorful tapestry that is a background for wildlife. Meadow gardens are the perfect landscape for a habitat gardener, like myself, who gardens in support of local wildlife, because such a garden is friendly to all kinds of life, including humans. Birds, butterflies, and bees will quickly find a meadow garden and make themselves at home there. Small reptiles, amphibians, and even mammals will make it their home as well. Greenlee offers his readers specific advice about the preparation of the site for the meadow garden, as well as plant selection and maintenance. Again, maintenance, once the garden is well-established is really minimal. He gives lists of various ornamental grasses and information about how they perform in different climates and areas. Greenlee's passion for meadow gardens is contagious and he is very persuasive. But if the reader is unconvinced by Greenlee's words, she may find her resistance melting in the face of Saxon Holt's beautiful photographs. Looking at these pictures, it is very hard to see why anyone wouldn't want her front yard - or, indeed, her backyard - to look like that. Meadow gardens are one of the hot trends in gardening today. They are definitely making inroads into those broad, green, ecologically dead zones that Americans have favored for so many years. One hopes that Greenlee's lovely book might help to push that trend along. I don't have this book, I'll put it on my wish list. I wouldn't say I have a meadow garden, more of a cottage garden with lots of native plants. I love the Lurie Garden, which is I think a meadow garden on a large scale. I'm with you. Mine is more of a cottage garden, too, with some elements of a meadow garden. I have too many trees to have a full meadow garden. They can be quite beautiful though and are probably the wave of the future in gardening.